The Hiawatha Light Rail Line connecting Target Field in downtown Minneapolis with the Minneapolis-St. Paul International Airport and the Mall of America, originally opened in 2004, has been rebranded to the METRO Blue Line as of 2013. All Blue Line trains have three cars. The train connects 19 stations (including one with 2 platforms) over 12 miles and you can get from Target Field to the Mall of America (or vice versa) in just over 40 minutes. 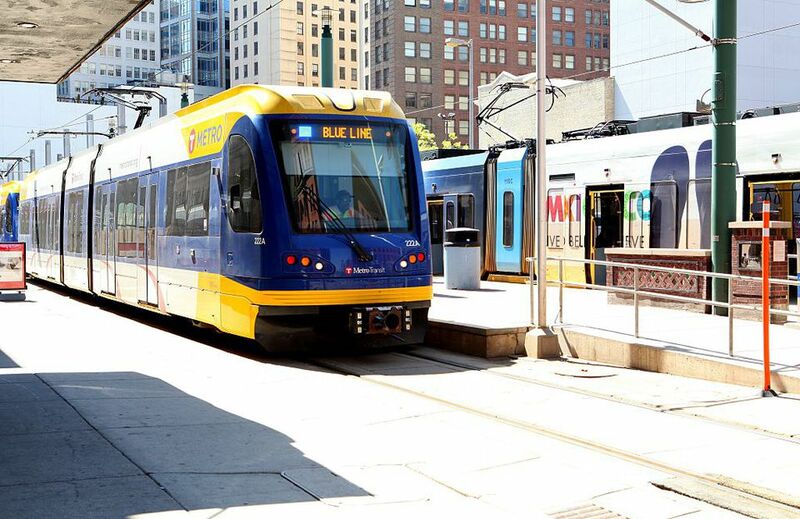 The line is operated by Metro Transit, who also run the Twin Cities' buses and the new METRO Green Line light rail, connecting stations downtown to the University of Minnesota and St. Paul. The Blue Line trains run 20 hours a day and are shut down between the hours of 1 a.m. and 5 a.m., aside from between the two terminals at Minneapolis-St. Paul International Airport. Between Terminal 1-Lindbergh and Terminal 2-Humphrey, service is provided 24 hours a day. The trains run every 10-15 minutes. The line starts at the Minnesota Twins ballpark, Target Field, just west of Downtown Minneapolis. The line runs through the Warehouse District, through downtown, past the U.S. Bank Stadium, and through the Cedar-Riverside neighborhood. Then the line follows Hiawatha Avenue through Midtown to Hiawatha Park and Fort Snelling, then on to the Minneapolis-St. Paul International Airport and the Mall of America. Buy a ticket before boarding the train. The stations are unstaffed and have automatic ticket machines which take cash, credit cards, and debit cards. You can also purchase a ticket on the Metro Transit app on your smartphone. Riders may pay for a single fare, or choose an all-day pass. A single fare for the train costs the same as a bus fare. As of January 2018, the fare is $2.50 during rush hours (Mondays through Fridays, 6 to 9 a.m. and 3 to 6:30 p.m., not counting holidays) or $2 at other times. Aside from during rush hours, reduced fares are offered for Seniors, youth, Medicaid card-holders, and people with disabilities. Go-To Cards are valid for use on trains. You can load these reusable cards with a set dollar amount, a set number of rides, a multi-day pass, or a combination of a few options. Ticket inspectors randomly inspect passengers' tickets, and the fine for traveling without a ticket is very steep ($180 as of January 2018). Since parking in Downtown Minneapolis is always expensive, commuters use the light rail to get to work. Visitors to Downtown Minneapolis attractions such as Target Field, the U.S. Bank Stadium, the Target Center, and the Guthrie Theater find the light rail very convenient. It's usually cheaper to drive to a park-and-ride station with free parking and ride the train than to park in Downtown Minneapolis. This is especially true for those going to a game or event when parking rates will surely be hiked. Several bus routes are timed to meet trains to make travel convenient for commuters who don't live near a station. Overnight parking is not permitted, though you may find a couple of spaces designated for one night's parking only. There is no Park and Ride parking at the Mall of America. The enormous parking ramps are tempting, but you will get a ticket if you are seen parking and leaving on the train. The 28th Street Station park and ride lot is three blocks east of the Mall. Light rail trains travel much faster than freight trains, up to 40 mph. So it's very unwise to try to run the barriers. Drivers should watch for pedestrians, cyclists, and buses at stations. Cross the tracks only at designated crossing points. Be extremely careful crossing the tracks. Look both ways and listen for train lights, horns, and bells. If you see a train coming, wait for it to pass, and make sure another train isn't coming before crossing. What Is It Like to Live in Minneapolis?